A cold, wet and stormy day today. Best to stay inside and keep dry and warm. It’s thundering and raining and blowing a gale. I would like to bake cookies and eat the whole batch, drink eighteen cups of tea and watch TV shows about people who spend millions of dollars restoring old buildings. It’s THAT sort of day. I’ve tried very hard to be creative and artistic this afternoon. 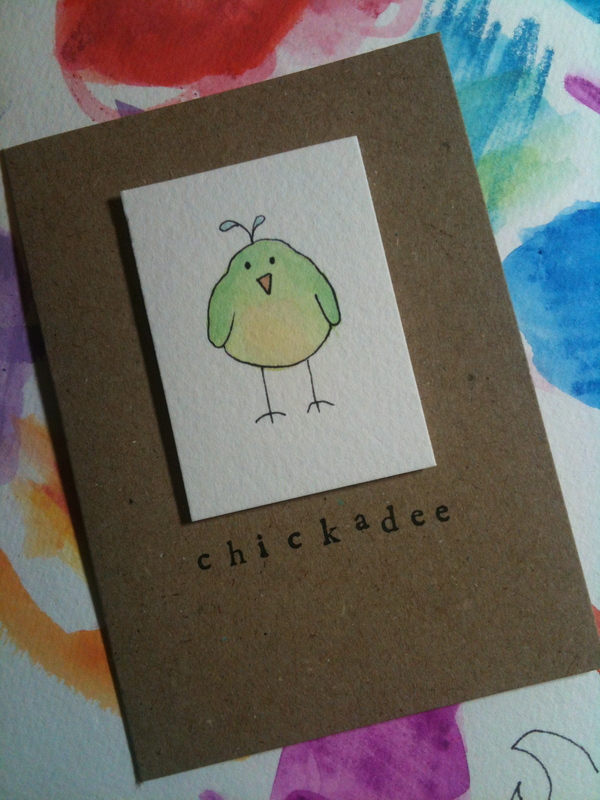 Have succeeded in making a mess and one sad little Chickadee card which took me far longer than it should have. But for some reason he makes me smile and that will have to do for today. Back to work tomorrow – am trying not to think about it. Thinking about it makes me depressed and that doesn’t help the creative process (I’m not Van Gogh after all). Sigh. If only workdays could be split up into sessions, like in school. Or, better still, like in kindergarten, then you could have a nap in the afternoon! I’d probably look forward to recess and play-lunch too… “Free study” period would be a problem because I would probably waste it trying to decide what to do and then it would be time to pack up. I wouldn’t nominate to do P.E because, pfft, I didn’t want to do that in proper school, why would I do it now when things are even wobblier and wheezier than they were back then? Home time would be awesome – I’ve always thought there should be a bell or siren or something to signify the end of the day so you could rush to cram all your stuff in your bag and race out the door yelling “Whoooooooo!” or something. I don’t know how my boss now would react to that…he thinks I’m weird already. So, tomorrow, I shall try and break the day up into modules. It might help the time pass more quickly. I can swap my lunch with someone and copy my neighbour’s work. I can keep putting my hand up and asking people if I can go to the bathroom. I can run around and split my knee open and ask to be taken to the nurse while my friends cluster around me looking nervous because I’ve gone a weird colour. It’s worth a try. Do you have ways of making your workday go faster?